(PhysOrg.com) -- Just as some drivers obey the speed limit while others treat every road as if it were the Autobahn, some stars move through space faster than others. NASA's Wide-field Infrared Survey Explorer, or WISE, captured this image of the star Alpha Camelopardalis, or Alpha Cam, in astronomer-speak, speeding through the sky like a motorcyclist zipping through rush-hour traffic. 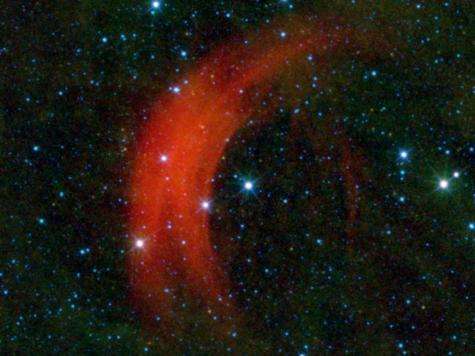 The supergiant star Alpha Cam is the bright star in the middle of this image, surrounded on one side by an arc-shaped cloud of dust and gas -- a bow shock -- which is colored red in this infrared view.